With The Cuckoo's Calling, J.K. Rowling (under the pseudonym Robert Galbraith) demonstrates that her writing talent extends beyond creating wonderfully inventive fantasy worlds aimed at the younger set. 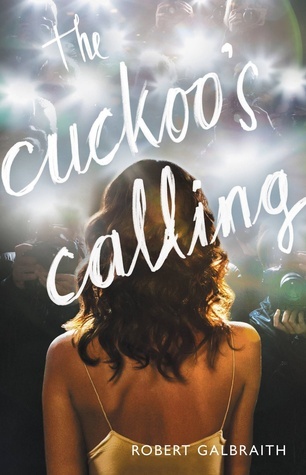 To be honest, The Cuckoo's Calling is fairly standard as contemporary mysteries go - clever plot with inventive twists, red herrings, and minor details that are revealed to be the lynch pin in catching the murderer - but Rowling definitely brings her trademark flare for creating interesting and unique characters into play. And her gift for creating the perfect names for her characters is evident, too. Cormoran Strike is a private investigator, a military police veteran who lost his lower leg to an IED in Afghanistan. Strike's personal life is falling apart - his on-again-off-again fiancee finally called it quits for the last time - leaving him living out of his office. His sister Lucy does not approve of anything he does. He is deeply in debt to his estranged famous father. His business is struggling with only a single client, suspicious that her husband is having an affair, and a receptionist he can't really afford from a temp service. When John Bristow, the brother of Cormoran's childhood friend who died as a boy, shows up asking for help investigating his adopted sister's death, ruled a suicide by police, Cormoran reluctantly takes the apparently hopeless case. In doing so, he demonstrates both an admirable empathy for others and the pain he still feels for losses in his past. Robin Ellacott, the aforementioned temp, is newly engaged and looking for a permanent position, but is fascinated by detective work and shows ingenuity, adaptability, and creativity in assisting Cormoran. Her fiance does not approve of the work, but Robin persists in spite of opportunities to work elsewhere. Lula Landry, Bristow's adopted sister, is a glamorous and in-demand fashion model. She had recently started searching for her birth parents before her death. One of Rowling's greatest accomplishments in The Cuckoo's Calling is the life she breathes into this dead girl who we learn about only through the recollections of her friends, co-workers, and acquaintances. Reading the novel, Lula becomes just as real as any of the other characters. Tonight, though, he could not help seeing his mother as a spiritual sister to the beautiful, needy and depressive girl who had broken apart on a frozen road, and to the plain, homeless outsider now lying in the chilly morgue. Leda, Lula, and Rochelle had not been women like Lucy, or his Aunt Joan; they had not taken every reasonable precaution against violence or chance; they had not tethered themselves to life with mortgages and voluntary work, safe husbands and clean-faced dependents: their deaths, therefore, were not classed as "tragic," in the same way as those of staid and respectable housewives. How easy it was to capitalize on a person's own bent for self-destruction; how simple to nudge them into non-being, then to stand back and shrug and agree that it had been the inevitable result of a chaotic, catastrophic life. It's difficult to review a mystery novel without giving away too much of the plot, so I'll end here with a quick language warning. There are a lot of f-bombs in The Cuckoo's Calling. There's other foul language, too, but mostly f-words. Maybe not quite as many as in Rowling's The Casual Vacancy, but still, an awful lot. Definitely not a book for kids. The other issue, of course, is the fact that JK Rowling stole valor with her pseudonym's back-story.